Part of a Country Park with lovely informal grounds. Mount Edgcumbe House and Garden is a Grade 1 Historic landscape, and 10 acres of garden in English, French and Italian styles of 18th - 20th century. Spectacular seaside setting by shingle beaches. 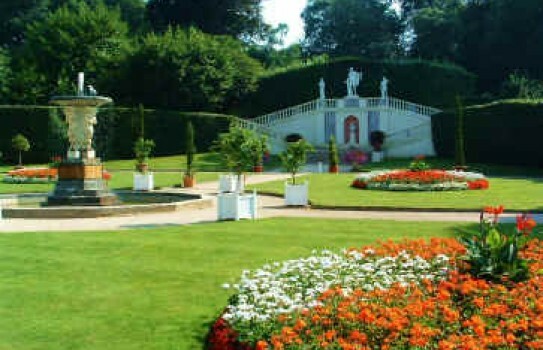 The Earl's Garden comprises a shrub garden and informal terrace with a rare18th century shell grotto and is near the Mount Edgcumbe House set on the hill. Lower down there are 2 gardens to commemorate the family's historical links with New Zealand and America. There is a National collection of camellias as well as many other shrubs and plants. Mount Edgcumbe House and gardens are well worth visiting. 2019 - Mount Edgcumbe Gardens and Country Park open all year . Dogs on lead. House and Earls Garden - See website for openings. No dogs. Disabled access, refreshments, shop and plant sales. If you want to find places to stay, why not stay in one of our recommended hotels. Each hotel has genuine guest reviews enabling you to book from anywhere in the world in total confidence. Not only do we feature hotels near the garden, we also feature hotels worldwide and at all major airports. Special prices up to 70% off standard rates as well as hundreds of exclusive deals. Look now - click here.